On October 24 U.S. 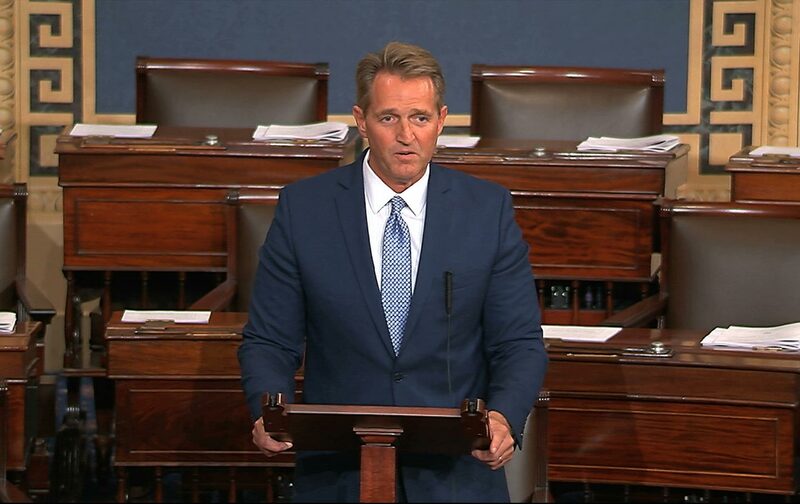 Senator Jeff Flake (Rep., AZ) gave a moving speech on the floor of the U.S. Senate rejecting President Trump’s character and actions and announcing the senator’s decision to not seek re-election in 2018. He simultaneously extended his thoughts in the Washington Post, which commended him for his words and actions. I immediately sent him a letter thanking him for his speech and for his advocacy of U.S.-Cuba normalization, and on November 6 Senator Flake made a public response to the many letters he has received about his speech. Here is a summary of these events. The Senator said, “I rise today with no small measure of regret. Regret, because of the state of our disunion, regret because of the disrepair and destructiveness of our politics, regret because of the indecency of our discourse, regret because of the coarseness of our leadership, regret for the compromise of our moral authority, and by our – all of our – complicity in this alarming and dangerous state of affairs. It is time for our complicity and our accommodation of the unacceptable to end.” Below is a photograph of Senator Flake giving his speech. I urge my fellow U.S. citizens to join in the commendation of Senator Flake for his outspoken defense of true American values and to call for the resignation or removal of Donald Trump from office under the provisions of the U.S. Constitution. U.S. Senate, Flake Announces Senate Future ( Oct. 24, 2017); Full Transcript: Jeff Flake’s Speech on the Senate Floor, N.Y. Times (Oct. 24, 2017). Flake, Enough, Wash. Post, (Oct. 24, 2017). An inverse historical example for Senator Flake’s criticisms of President Trump is President Eisenhower’s behind-the-scenes campaign to destroy his fellow Republican, Senator Joseph McCarthy, which is the subject of David A. Nichols’ Ike and McCarthy: Dwight Eisenhower’s Secret Campaign Against Joseph McCarthy (Simon & Schuster 2017). Jeff Flake: In a Democracy, There Can Be No Bystanders, N.Y. Times (Nov. 6, 2017).